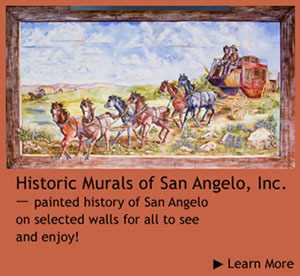 Our main project for 2012 was the Military Mural, located at 108 E. Concho in downtown San Angelo. Three different themed panels make up the entirety of the Military Mural-Fort Concho, San Angelo Army Air Field, and Goodfellow Air Force Base. We hope you enjoy viewing, reading, and hearing about the military history of our town. 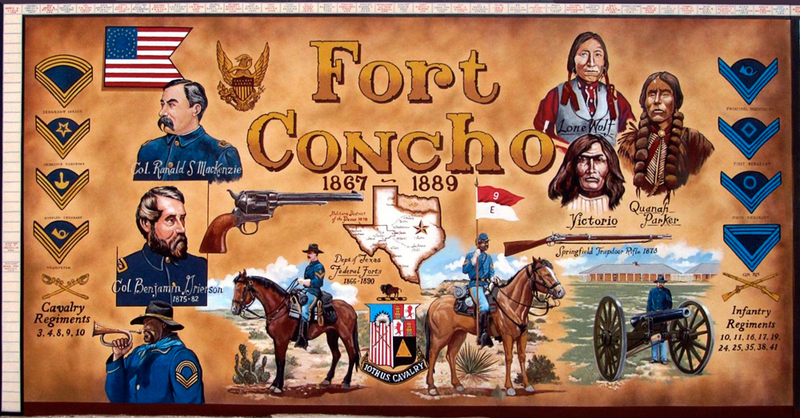 Fort Concho was established as a United States Army post in November 1867 with five companies of the Fourth Cavalry. It replaced Fort Chadbourne, which was closed the same year due to a chronic shortage of water. The new post was first named Camp Hatch and then Camp Kelly. In March 1868, it was named Fort Concho after the Middle and North Concho rivers, which converge in San Angelo to form the Concho River. During its 22-year existence as an active Army post, Fort Concho mainly served to maintain trade routes and to protect frontier settlers, stagecoaches, wagon trains and the U.S. Mail. Fort Concho was home to both cavalry and infantry, and 50 percent of the enlisted soldiers were black. The Indians called them "buffalo soldiers" because of the color and texture of their hair. Two of the commanders are pictured in the mural. Col. Ronald MacKenzie was appointed colonel of the 24th U.S. Infantry regiment in 1867. He is considered by many as the dominant figure in the history of Fort Concho. Due to a previous battle wound that cost him the first two fingers of his right hand, the Comanche nicknamed him "Bad Hand." Col. Benjamin Grierson commanded Fort Concho's regimental headquarters for the 10th U.S. Cavalry, known as the Buffalo Soldiers, from 1875-1882. Their Coat of Arms is painted between the two mounted soldiers. Three well-known Indian chiefs are included in this mural as testament to their leadership roles in trying to thwart the westward push of the settlers. Lone Wolf was a principal chief of the Kiowa and led fierce raids into Texas in the early 1870s in reaction to massive encroachment on their lands and the slaughtering of huge buffalo herds. Victorio was a warrior and chief of the Chiricahua Apache in what is now New Mexico. He was a marauder and was chased across Texas and New Mexico for years before finally being surrounded and killed in October 1880 by Col. Joaquin Terrazas, noted Indian fighter and leader of the Chihuahua state militia. Quanah Parker was a Comanche chief and a leader in the Native American Church. He was also the last leader of the powerful Quahadi band before they surrendered in the Battle of the Great Plains and went to a reservation in Indian Territory in 1875. He was the son of Comanche Chief Peta Nocona and Cynthia Ann Parker, kidnapped daughter of Silas M. Parker, one of the founders of Fort Parker. Cynthia and her brother, John, were captured and their father was killed when the Caddo and Comanche Indians attacked and overran Fort Parker on May 19, 1836. She was about nine years old. The handgun pictured is the Army model 1873 Colt .45 single-action revolver known as the "Peacemaker." This six-shooter was usually issued to the mounted cavalry soldiers, and it made a huge difference in their fighting effectiveness. The Peacemaker became the standard sidearm of the postwar military, the Texas Rangers, and the majority of cowboys across the plains. The model 1873 "Trapdoor" Springfield was the first standard-issue breech-loading rifle adopted by the U.S. Army. It shot a .45-caliber lead bullet backed by 70 grains of black powder. This was a powerful weapon, but was also prone to the spent cartridge jamming in the breech during rapid-fire conditions. Fort Concho's cannon is also represented in the mural, though artillery was often of limited use in fighting the Indians. The rough West Texas terrain coupled with the elusive fighting style of the Indians made a heavy piece of ordnance difficult to use effectively during battle situations. More commonly, the cannons were used in post ceremonies, like the morning and evening salute.